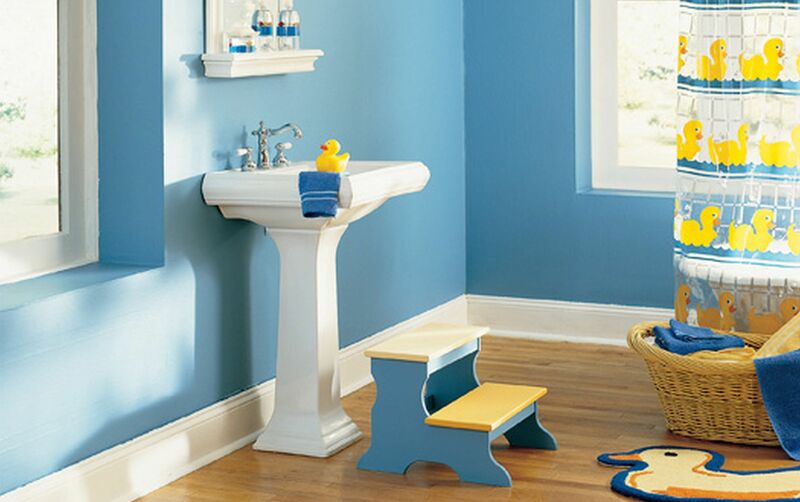 Making your bathroom—and bath time—safe and fun for the kids is always a challenge. Fortunately, today’s market is loaded with products to help you achieve both goals! Safety 1st Swing Shut Toilet Lock—automatically locks when the lid is lowered and can be opened with one hand. Guaranteed to keep out little hands those toys they love to drop in. Mommy’s Helper Safer Grip Traveler—small enough to take on trips, this portable bathtub/shower grab handle allows kids to get in and out of slippery places safely. Holds tight, removes in a snap. Summer Infant Comfy Bath Sponge—an economical, non-slip contoured sponge that safely cradles baby for bathing in sinks, baby tubs and adult tubs. Sesame Street Bathtub Bumper—an inflatable bumper that attaches with suction cups and fits most standard bathtubs to cushion those hard surfaces. Deflate for travel and storage. Nickelodean Paw Patrol Soft Potty Seat—soft, portable, easy-breezy cleanup. Built-in handles for transport and a shield for little guys. Susen Safe Shampoo Shower Bathing Protect Soft Cap Hat—an adjustable cap (infant to 6 years) designed to protect tender eyes and ears from shampoo and water. Ozeri Turtlemeter—combination toy and tub thermometer, floating and submersible, that checks and digitally displays water temperature every second. Boon Flo Water Deflector and Protective Faucet Cover with Bubble Bath Dispenser (not for children under 3 years)—made of soft, protective material, the deflector slips easily over the faucet to create a gentle waterfall effect and dispense bubble bath at the push of a button. Bumbo Step Stool—available in pink or blue and resembles an elephant’s foot! The slip-resistant base and surface provide a stable boost for toddlers trying to reach sink or potty. Baby’s Journey Comfy Cozy Towel Warmer—warms two hooded towels in about 8 minutes. Also works for bodysuits and blankies! Baby Aspen Let the Fin Begin Shark Bathrobe—light pink with a toothy, shark-smile hood, appliqued black eyes and a shark’s tail bottom. 100% cotton and machine washable! Aquatopia Deluxe Safety Bath Kneeler—keeps mom/dad comfy during bath time with an anti-slip cushioned pad for knees and elbows. Pockets keep bath supplies downright handy. Boon Bug Pod Bath Toy Scoop (not for children under 3 years)—a drainable ladybug scoop to make rounding up and rinsing bath toys easy as pie. Comes with a wall-mounted base for storage. Ginsey Elmo Shower Spray—a suction cup keeps Elmo anchored in the tub, while the push of a button sends up a soft, playful shower spray. Give a Hoot Toothbrush Holder—room for 4 toothbrushes on a rosin tree with four bobbling-owl accents. Star Crayon—let the kids draw on bath tiles or shower walls in 6 different colors, all kept together in one kid-fist sized base. Terrycloth Bug Tub Puppets—set of three (bumblebee, butterfly and ladybug) finger puppets with a waterproof lining. Perfect for bath time fun! Alex Tub Tunes Dub Water Flutes—kids can create songs when you fill the flutes with different amounts of water. Bath Time Body Paint—PH-balanced soap in red and blue, served in tubes designed for small hands. Gently cleanses and moisturizes, all at the same time. Color My Bath Color-Changing Bath Tablets (not for children under 3 years)—30 non-staining, earth-friendly tablets in assorted primary colors that will transform bath time into a rainbow of fizzy fun!